Here you will find a moisture tester for wood to determine absolute moisture in different wood types. Newly-cut logs can have a moisture content of 80% or more, depending on the type.Since wood shrinks substantially when dried, it must be dried before being used in construction or most other applications. This is most often done using a large furnace called a kiln. The air drying method may also be used, but this is much slower. With the help of the moisture tester for wood you will be able to measure with high accuracy moisture in, not only raw wood, but also rolled paper products, planks, slats, beams, plywood, panels, particle board, main beams, window frames, etc., anything wooden. There are two ways of measuring moisture, these two ways are with or without damaging the material. 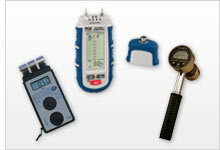 The majority of types of moisture testers we offer at PCE do not damage the wood, or damage it very slightly. The moisture tester for wood is characterized by the measuring principle and the moisture sensors that can be adapted to it. The moisture tester for wood has special characteristics such as an automatic compensation of temperature. Besides, data can be stored and transferred to a PC or laptop, or characteristic curves can be programmed for specific wood types (only with the model FMD). Our moisture tester are of the highest quality standards in the industry, and are durable and easy to use. PCE-HGP is a multifunction moisture tester for wood that uses penetrating pins to measure the moisture content of wood and other construction or building materials. PCE-HGP also measures the relative humidity (RH) and ambient temperature and calculates the dew point temperature of the air. PCE-WMH-3 is a portable handheld digital moisture tester or analyzer used to measure the moisture content of wood. This hammer-style wood moisture analyzer features preset characteristic curves for measuring moisture in 270 different wood types. PCE-MMK 1 is a portable handheld digital moisture meter used to measure the moisture content of wood, paper, textiles, concrete and other building materials. This multifunction moisture tester for wood also measures ambient temperature and ambient relative humidity. PCE-WP24 is a moisture tester or meter for wood used to perform noninvasive, nondestructive moisture measurements of wood, timber and other construction or building materials. An ideal tool for assessing everything from lumber to floors and more, this moisture meter uses electromagnetic waves that penetrate approximately 50 mm / 1.96 inches to 60 mm / 2.36 inches deep (depending on substrate) to return a mean-value moisture content percentage. The Moisture Tester for wood is designed for professional use in the control output of sawmills in the input or control of pellet mills, manufacturers of heating briquettes and other branches of production. The Moisture Tester for wood determines the absolute moisture of sawdust and other types of biomass, such as Wood shavings, hay, straw. The moisture tester for wood PCE-MA 50X is an innovative solution for the fast and highly accurate determination of moisture in a wide variety of materials. The precision weighing scale uses weighing technology from the analytical balance range and is operated in combination with a drying chamber. - Especially for very dry samples such as ABS / PET etc. The Moisture Tester for Wood FMW-B determines moisture content by means of the capacitive method. With the Moisture Tester for Wood an electromagnetic field quickly determines capacitance of wood. The Moisture Tester for Wood FMW-T covers all your needs while measuring moisture contents in all types of wood and building materials. The Moisture Tester for Wood works without causing any damage to the material and it is mainly used to measure building walls. Moisture analyzer with stick-in probe (1 meter length) for precise determination of water content in timber. The Analyzer is equipped with a datalogger. Easy to use moisture analyzer: Plug the probe into the wood chip pile, switch on the test instrument and read out the water content in %. The measurement data can be stored in the moisture Analyzer itself and later on sent to a laptop or PC. The instrument is delivered manufacturer calibrated and can be certified to ISO. The FMD 6 is a handy and versatile moisture tester for wood for reliable measurement of the moisture content of paper, wood and construction materials. The moisture tester for wood has preset characteristic curves for the moisture measurement of specific materials. The moisture tester needs external sensors (sold separately - please see accessory list) to operate. The sensors can be positioned on the surface of a material or inserted into a material, thereby permitting either non-destructive or destructive measurement.